A friend of mind asked me to comment on the Nanex article Perfect Pilfering, a detailed exposé on how the market is rigged from a data-centric approach. We received trade execution reports from an active trader who wanted to know why his large orders almost never completely filled, even when the amount of stock advertised exceeded the number of shares wanted. For example, if 25,000 shares were at the best offer, and he sent in a limit order at the best offer price for 20,000 shares, the trade would, more likely than not, come back partially filled. In some cases, more than half of the amount of stock advertised (quoted) would disappear immediately before his order arrived at the exchange. This was the case, even in deeply liquid stocks such as Ford Motor Co (symbol F, market cap: $70 Billion, NYSE DMM is Barclays). The trader sent us his trade execution reports, and we matched up his trades with our detailed consolidated quote and trade data to discover that the mechanism described in Michael Lewis's "Flash Boys" was alive and well on Wall Street. You can clearly tell when the trade hits: activity explodes to over 80 quotes in 1 millisecond (this is equivalent to 80K messages/second as far as network/system latency goes). But the point here is that nothing was going on in this stock in the immediate period before this trade hits the market. In this particular example, there were a total of 24,800 shares advertised for sale at $17.38 (all trades and offered liquidity will be at this same price) from 8 exchanges. The trader wanted 20,000 of these shares. What he got was only 12,133 shares and 600 of these were on a dark pool (which wasn't part of the 24,800 shares of liquidity on the lit exchanges)! Worse, someone ELSE was filled for 1,570 shares during these same milliseconds! Remember, nothing was happening in Ford until this order came into the market. Based on the other 4 examples, we are sure that no trades would have occurred during these few milliseconds of time if it wasn't for this trader's order. What happened to the 24,800 shares offered and why couldn't he get at least 20,000 of them? How is it that others were able to get shares during this time? This is especially disturbing when you consider these other traders (HFT) only bought shares in reaction to the original trader's order. 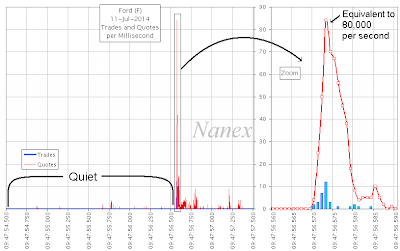 Nanex goes on to discuss detailed analysis of the trade as well as "phantom liquidity". Recall that "liquidity" is the alleged benefit of HFT. The article shows that order cancellations happen far faster than trade executions, and that is why the Ford trader wasn't able to get the advertised liquidity - the orders simply disappeared faster than exchanges processed his buy order. Nanex concludes "If you believe that the industry can fix these problems on their own, then we believe you are no longer fit to regulate, because that is not, and never was, how Wall Street works. Honestly, a free for all, no–holds–barred environment would be better than the current system of complicated rules which are partially enforced, but only against some participants. And make no mistake, what is shown above is as close to automatic pilfering as one can get. It probably results in a few firms showing spectacular, perfect trading records; it definitely results in people believing the market is unfair and corrupt." I agree with the conclusion, also noting that insider trading is allowed for members of Congress but no one else. But did Namex really reveal anything? The answer is not really. 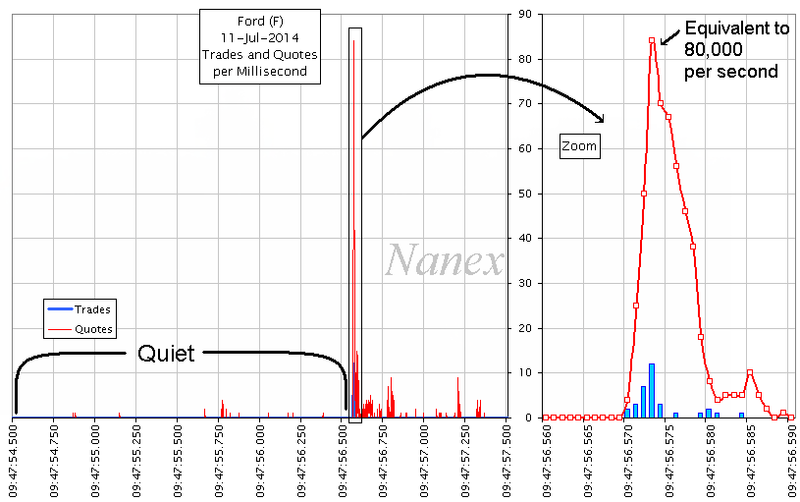 There were spoof bids and offers in the markets long before the arrival of HFT. Yet, things are undoubtedly worse today with more spoofs from fewer and fewer places. That is the only way some HFT systems can go for months or longer without reporting a single loss for even a day.